But what should my offer be? How do I stand out against the competition? What if my clients think I’m stupid or a sell-out? I feel ya! So many questions, and all totally valid concerns. We’ll get to these in one hot minute but first, let’s talk about why BFCM is an awesome marketing opportunity for small, nimble, creative business owners like us. Creating a quick, smart, profitable Black Friday offer that your customers will love is simpler than you think. 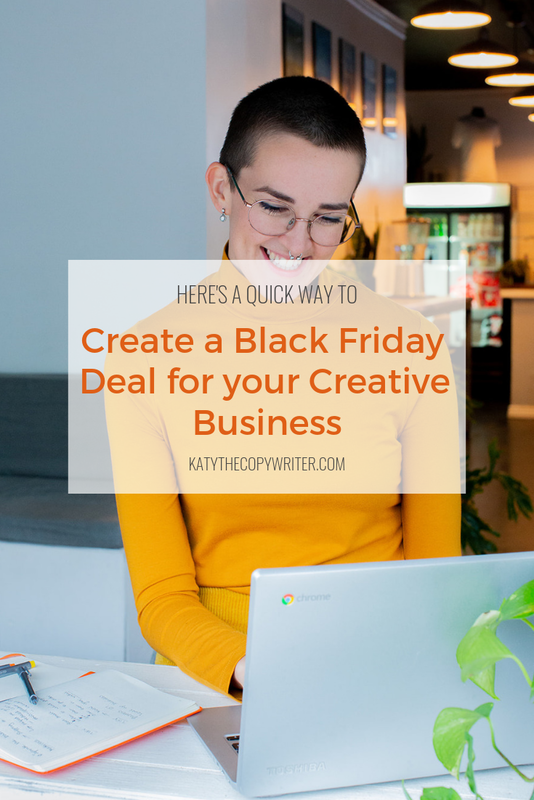 Why should I create a Black Friday offer? Black Friday is the day after American Thanksgiving, and this year falls on Friday, 23rd November (2018). It also happens to be the busiest shopping day of the entire year, with an eye-watering $7.9 billion spent on Black Friday last year, followed by a staggering $6.6 billion in online sales following on Cyber Monday. If you think that’s a big deal, bear in mind those numbers only cover the U.S.
Quite simply - people are ready to buy. They’re in the right mindset to spend money, and the Amazon, Walmart, Macy’s and Tesco of the world are already doing the heavy lifting in terms of BFCM awareness. They commit unholy advertising budgets to whipping the world up into a buying frenzy. All you need to do is ride the wave. Before we go any further, let’s get on the same page real quick. I understand that creating special offers can ignite those horrid tummy squirms and self-doubt feels. Why is that? Chances are, at some point, you’ve been either ripped off, or pressured to buy something you didn’t need or couldn’t afford in the first place. And now, the last thing you want to do is make anyone else feel pressured or given the hard sell. Sound about right? The secret is, to only create genuine offers, and commit to ethical selling. To help freelancers and small business owners, I’ve created a Commitment To Ethical Copywriting, which you can check out, and sign up to here. If you’re still feeling jumpy about writing a BFCM deal, this should help you. But what should my offer be? - Your offer should include your most popular, most profitable, and most favouritest product or service. To feel good sharing your offer with confidence and conviction, you’d better be excited about it. Pick something you love, whether it’s the top-rated print in your Etsy store, your signature headshot photography package, or your 1-hour copywriting consultation, you gotta be pumped to share it. How should I price it? - You’re going to price it exactly the same as you normally do. Yes, that’s correct, you read that correctly. More on that in a minute. What if I lose money? - Not gunna happen - see above. How do I stand out against the competition? - Because you’re not going to be competing with a bland, crappy offer that no-one cares about, you’re creating a smart offer - see below. What if my clients think I’m stupid or a sell-out? - Not going to happen. Because we’re going to create a smart offer. One that’s classy, simple, and offers your customer epic value. The problem with most offers and discounts…. The main offender is “Get 10% off.” Please promise me to never, ever, ever offer ‘10% off’ as a deal to your customers. They lose, because the offer is boring, forgettable, and doesn’t really save them a memorable amount cash ($1.30 off my meal - who cares?). You lose because an offer like this won’t drive decision-making. The customers who take 10% off probably would have bought full price if you’d been a lil’ bit more tactful. The only thing 10% off does, is creep on your margins. Getting a stern warning is “BOGOF” - buy one get one free. They lose, because they only wanted one in the first place, and sure it’s free, but wtf are they supposed to do with that second consultation / PT intro session / website review? You lose, because you’ve missed out on an opportunity to show your customer another product or service, and open their eyes to ‘what else’ you can do for them. And let’s not forget “too good to be true” offers - the type where you’re at risk of overstretching yourself, and making your customer feel skeptical. If you’re offering 1 month of social media management for $75, then you might lose. If 10 people took you up on it, that would be a full calendar, and not enough bank to pay your rent. They lose, because you either have to withdraw the offer, or delivery a crappy service. You lose, because you have to dish out refunds and let folks down. The structure of your winning Black Friday offer is so quick and simple, that you’ll probably think I’m joking. Yep. That’s it. That’s literally it. Told you it was quick. But you’ll need the right X and Y, so you don’t wind up losing a ton of money, or creating a load of work for yourself. So first up, let’s pick your X. Your X needs to be something your customers already LOVE TO BUY from you. BFCM is not the time to try out a new product - besides, that’s going to take research or inventory or both, and the whole point here is for you to have an offer that’s easy and profitable. Choose a product or service that you know is popular, and gives you a good margin. Next, we’ll pick your Y. Your Y needs to be something that’s cheap (or even free) for you, but has a HIGH PERCEIVED VALUE for your customer. It also needs to be uncomplicated and easy to understand - any doubt in your customer’s mind will completely derail your BFCM offer. Keep. It. Simple. Book a Power Hour Copywriting Consult, and get a 30-minute follow-up session absolutely free. Buy a Personal Branding Photography Package, and get 10 extra hi-res edited images in your gallery at no extra charge. Download the latest digital copy of Battenberg Magazine, and get unlimited access to the full 2018 back-catalog for just $3. Order any A4 print from my signature series, and get free digital versions resized for Instagram and your phone background. Feel free to add a $value, if it helps. Hopefully that’s got your creative juices flowing, and you’re feeling confident to make this the year you finally take the plunge. Now, go create a Black Friday Cyber Monday offer that your customers and your accountant love! Black Friday is too good an opportunity to miss. Keep it ethical, and you’ve got nothing to worry about. 10% off is for losers. Offer a product or service that your customers already love. Share a freebie or low fixed fee bonus with a high perceived value. Make it crystal clear - confused customers never say yes! So, what’s your killer Black Friday Cyber Monday offer going to be? Share your ideas and inspiration in the comments. Wanna chat it over? Let’s talk. Still stuck for ideas? Or perhaps you want a hand turning your snazzy offer into a non-sleazy sales letter? That’s the kind of thing we can bust through in a 30-minute Disco Call.